Offering you a complete choice of products which include pp webbing. Backed by a team of skilled professionals, we are actively engaged in offering our clients a vast assortment of PP Webbing. Widely used in sports equipments, cargo, parachute, this webbing is woven by our skilled professionals using optimum quality fibers and innovative techniques. Our quality examiners test this webbing against different quality parameters so as to ensure its quality. Clients can avail this webbing from us at very reasonable price. PP Webbing is used in school bags as belts, thermo-wears, safety belts, etc. We are one of the eminent Manufacturers, Exporters and Suppliers of PP Webbing from Gujarat, India. 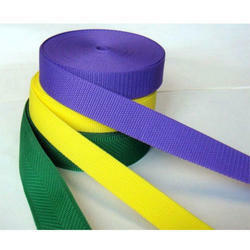 We make available PP Webbing in various designs, colors and a thickness ranging from 18 mm to 50 mm. To ensure their high quality standards, we test PP webbings for durability, accuracy. It is strong, narrow and closely woven fabric, and finds wide application in sports equipment, parachute, cargo, industrial safety etc.